The Rochester Housing Authority has created a shadow agency, one with employees, properties and an office. But this agency, Rochester Housing Charities, will not open its books to the public. Rochester for All is preparing to sue the agency to obtain records. The IRS signed off on Rochester Housing Charities’ creation in 2014. It’s not uncommon for housing authorities to create nonprofits, which may have more flexibility in administering projects and programs. Several current and former RHA employees came to us with concerns about the arrangement with RHC, noting property transactions. In November 2016, the City of Rochester sold two parcels of vacant land on Diamond Place to RHC. Last year, RHA transferred nine of its properties to RHC. One former RHA employee gave Rochester for All a $43,000 contract between a Washington, D.C. firm and RHC for workforce development and financial literacy services for RHA residents. The former employee was alarmed an out-of-town firm was retained and questioned whether services were performed. The RHA employees said they’re in the dark about RHC’s activities. 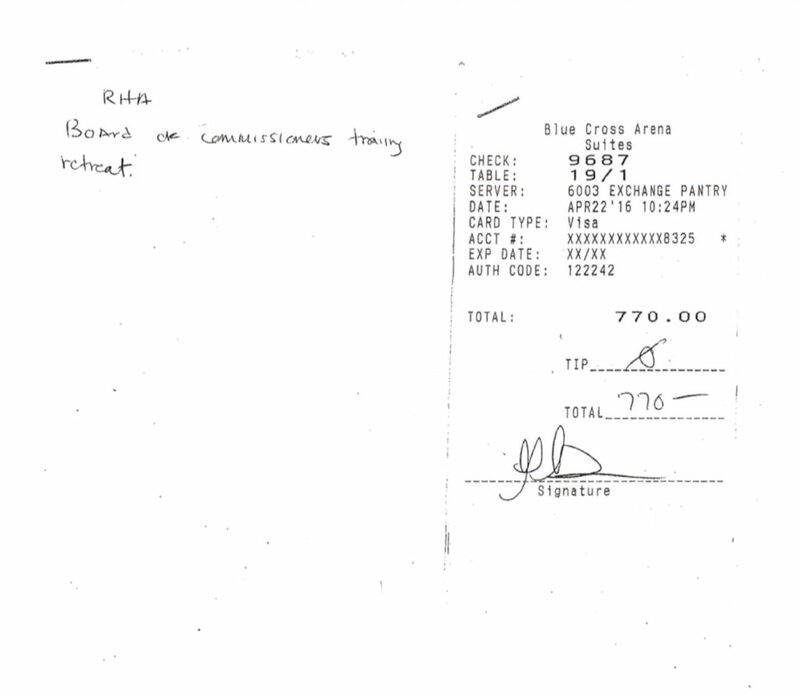 RHA Chairman George Moses was reimbursed for this receipt. Record obtained through FOIL. RHA reimbursed Chairman George Moses for a $770 receipt, stamped 10:24 p.m. on April 22, 2016 at a Blue Cross Arena suite. Someone hand-wrote on the receipt “RHA Board of Commissioners Training Retreat.” That evening featured a Katt Williams concert at the arena. RHA held a two-night, three-day retreat at Seneca Niagara Casino in November, 2017, costing more than $16,000. Some workers stayed overnight, but others had to drive back and forth from Rochester and be reimbursed for mileage. RHA made a $2,500 donation to Rochester Mayor Lovely Warren’s campaign in March 2014. It’s illegal to make a campaign contribution with public funds. Credit cards indicate frequent travel and restaurant purchases by board members, the executive director and staff. Page stayed at an Orlando hotel for five nights in January 2017. 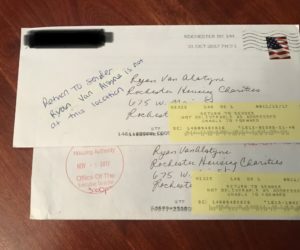 In an effort to learn more about RHC, we filed Freedom of Information Law requests with the Rochester Housing Authority (RHA) to view Rochester Housing Charities (RHC) payroll and contracts, and travel and credit card receipts, and 990 forms. Our requests were denied on the basis that RHC is a private, nonprofit corporation. Our appeal, which cited case law and opinions by the New York State Committee on Open Government, was also denied. H. Todd Bullard, an attorney at Harris Beach who does work for RHA, responded, “RHC controls its own assets, staff and management decisions. RHC does not hold itself out as an agent of the Authority and does not have any members of its board appointed by government officials.” Bullard added that RHA does not have any records pertaining to RHC, and RHC is privately-funded. Bullard’s arguments contradict documents on file with the state. The RHC incorporation papers state RHA has the power to approve the budget and officers of RHC. 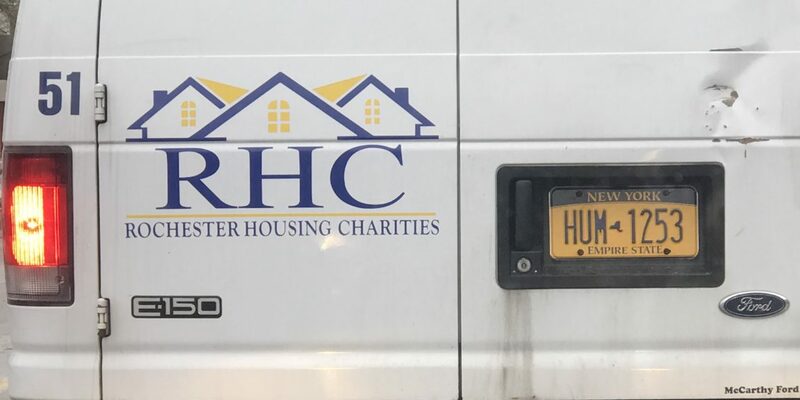 They also read RHC “shall be operated exclusively for the charitable purposes of benefiting and supporting the charitable activities of the Rochester Housing Authority.” The IRS determined RHC is a Type I supporting organization under section 509(a)(3). A Type I is operated, supervised, or controlled by a parent agency. RHA Deputy Executive Director Shawn Burr signed RHC’s purchase contract for the Diamond Place properties, which indicates RHC plans to develop the land. The public record makes it clear that RHA controls RHC. We later filed open record requests with RHC. Its 990 form lists its office at RHA headquarters. One of our envelopes was sent back marked “Return to Sender.” We found RHC’s new address by looking up a property deed. The address is in a building owned by RHA, across the street from its headquarters. Our open records to RHC went unanswered. Case law suggests RHC is subject to open records. If a nonprofit performs agency functions, and is a wholly-owned subsidiary of a governmental entity, it has to release records. For example, volunteer fire departments have to open their books. So do nonprofits created by the state for economic development purposes. Our only recourse is to file an Article 78 in court, asking a judge to force RHA and RHC to turn over records. Rochester for All will likely pursue this remedy an ask for attorney fees. It’s imperative that the public be able to inspect RHC records to ensure tax dollars are being spent wisely, and that low-income residents served by RHA and RHC receive good services. I am trying to understand why we need this organization. On the surface it appears to me to exist as a means of hiding or disguising government funded expenditures. Do they have any legitimate endeavors that RHA couldn’t have done directly? A ‘private’ charity? If the people, through the IRS, grant non-profit status, it’s because the agency has promised to serve a public function, and their books should be open.